Internal Combustion (IC) forklifts are what most people think of when they think of forklifts. 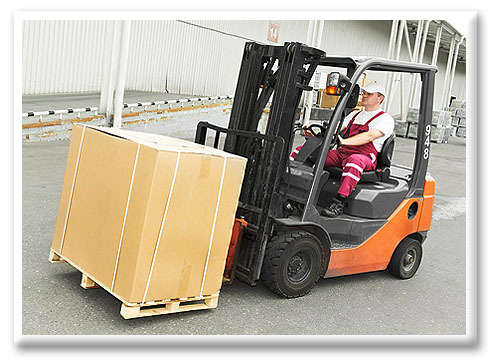 Class IV IC Cushion forklifts are the ones most commonly used in indoor applications. Their hard, cushioned wheels make them very efficient on flat, smooth surfaces, while their IC engines give them the power to carry extremely heavy loads. All Class IV forklifts are counterbalanced and designed for a seated operator. IC forklifts include gas, diesel, LPG and Natural Gas fueled engines. We have an enormous range of reconditioned Class 4 IC forklifts to choose from at Reconditioned Forklifts. Our cushion tire used forklifts are all inspected and reconditioned by highly experienced factory trained technicians, who go over every vehicle with a fine toothed comb before releasing a forklift for sale. Compression checks and other engine checks are just the beginning of the process. Of equal importance are our extensive safety checks. A gas forklift with a damaged mast, for example, is a dangerous forklift, no matter how well its engine is performing. An untrained eye can easily overlook a fractured or distorted mast, but our forklift technicians know exactly what to look for. At Reconditioned Forklifts, we have a 40 year commitment to value and service behind us and we take that commitment very seriously. It is not enough for us to simply sell our customers reconditioned forklifts. We want to sell them the right forklifts for the job and used forklifts that will give them many years of reliable service. If you are looking for a safe, reliable Internal Combustion Cushion Forklift, you have come to the right place.